Kasaragod, January 20, 2019: The news being spread on social media last couple of days in the city, regarding the demise of ‘Babiya’ crocodile which is a big attraction of Sri Ananthapadmanabha Swamy Temple, famous as a pilgrimage centre at Ananthapura of Kasaragod in Kerala, bordering DK, is a fake news. The new president of the administration committee of Ananthapura Kshetra, M V Mahalingeshwara Bhat, in a release on this issue stated that the crocodile at the temple is alive and healthy. 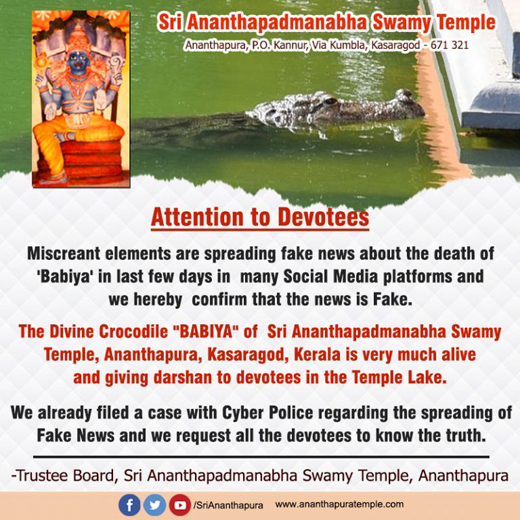 Lies have been spread on the social media with the aim to hurt the feelings of the devotees. A complaint will be lodged with the cyber police in this connection, he informed. Located in Kasaragod District of Kerala, this temple is often thronged by devotees to see Babiya, who lives in the care of local priests, who feed her ‘prasadam’ three times a day. Devotees who visit the pond, only to get a glimpse of Babiya, return overwhelmed when they see her feeding on their ‘prasada’ offering (strictly given by priests.) This hard to believe tale is of 60-year-old crocodile that hasn’t touched meat in years and guarding the premise; all in true devotion of Lord Vishnu. People often take bath in the holy water, but there hasn’t been ever a case of anyone being harmed by the croc.Babiya has been a resident of the temple lake for more than 70 years now.